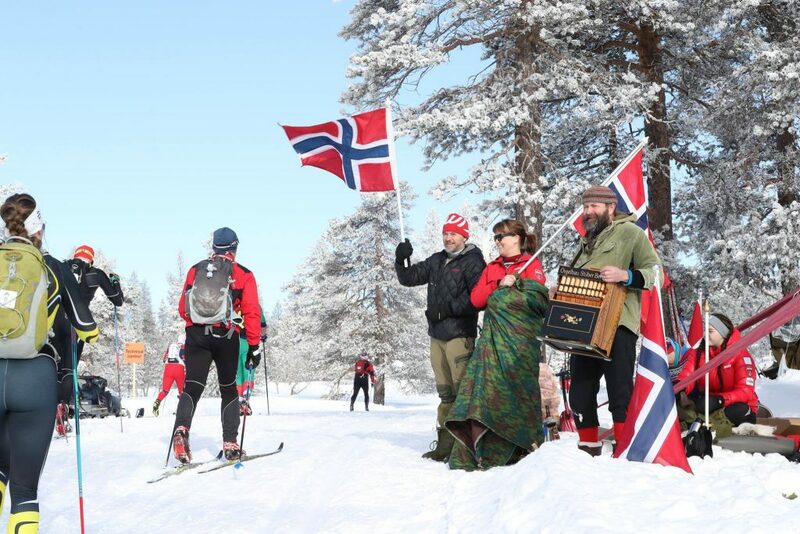 Like every year, thousands of cross-country skiing lovers honoured the legacy of the Birkebeiner warriors at today’s Birkebeinerrennet. 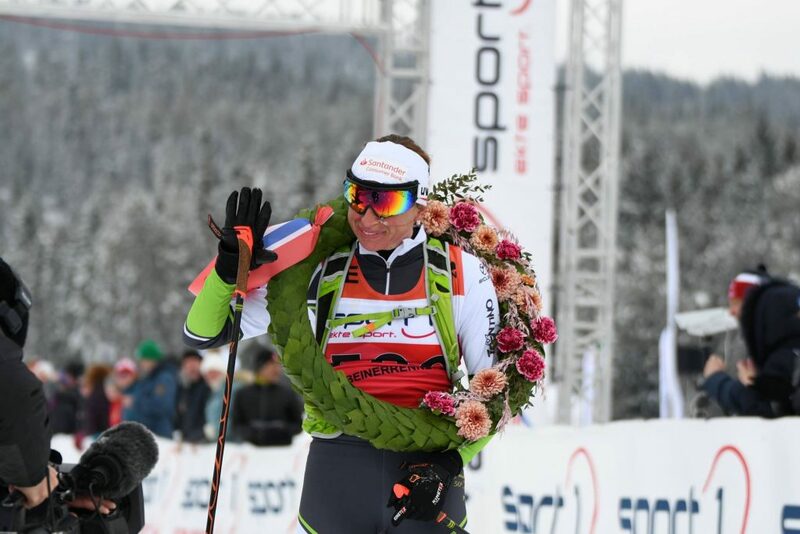 The victories in 2019 go to Poland’s Justyna Kowalczyk & Norway’s Petter Eliassen. Norway’s biggest cross-country skiing race is also one of the biggest xc-events in the world and a highlight in the Worldloppet calendar. Like every year thousands of Worldloppet skiers travelled to Lillehammer/Norway to collect a stamp in their Worldloppet passport. With its 54 km long course over the mountains between Rena & Lillehammer, it is probably not the longest marathon, but since the skiers have to pass the mountains, it is definitely a challenging one. A fact, that especially today’s winner likes. Petter Eliassen from Norway managed to strike again. After his victory in Italy, at the Marcialonga, he now attacked again at his home race, the Birkebeinerrennet. 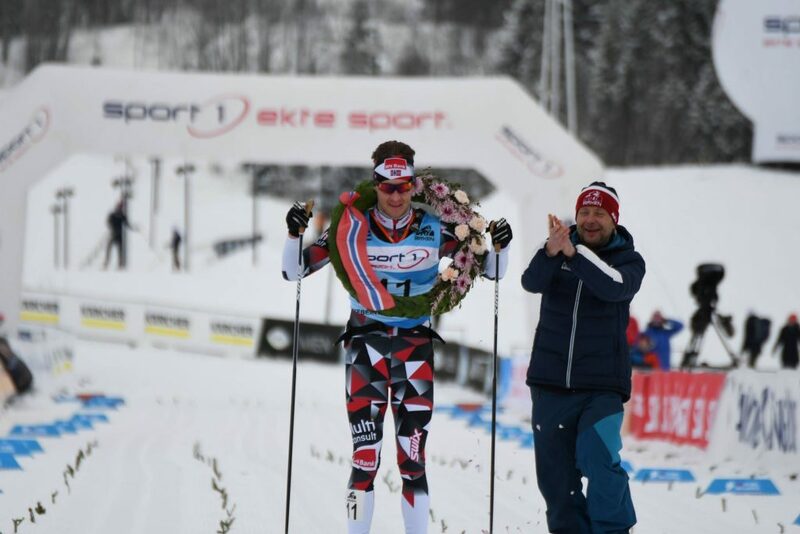 And he was not waiting until the finish lane to go for the victory, but he already attacked on the first 20 km, created a gap between him and the chaser group and never looked back again, skiing alone to the Lillehammer. “This is a good race and great course for me. I attacked early on and managed to keep the gap. I just tried to focus on my own performance and make sure that I won’t encounter any unwanted mishaps on the way. 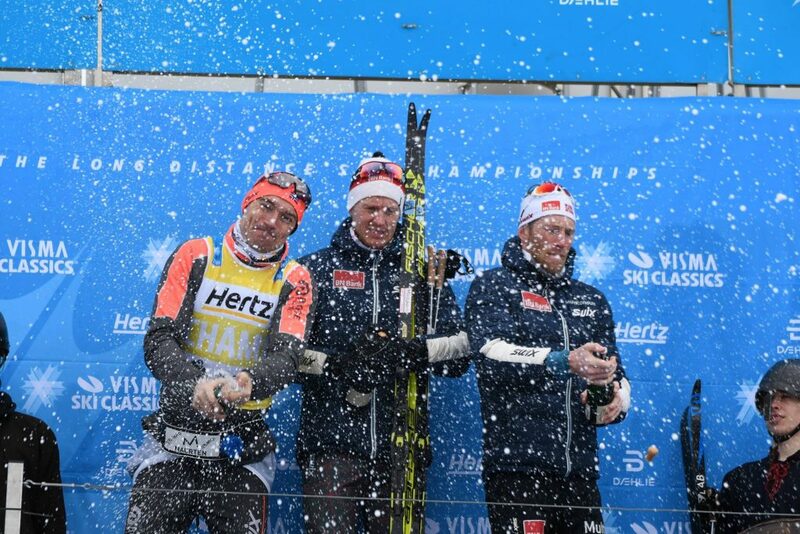 It was a perfect day for our team, and I’m happy that my teammates did so well too.”, says Eliassen after his victory in an interview with Visma Ski Classics. Behind Eliassen a 5-men-group headed to the finish together; four Norwegians, one Frenchman. Andreas Nygaard, last year’s Birken winner, showed his sprint skills and finished second before 3rd Simen Østensen. 2nd Andreas Nygaard, 1st Petter Eliassen, 3rd Simen Østensen. Also, Justyna Kowalczyk’s way to the victory in Birken 2019 led over a break-away quite early followed by fighting as a lone-wolve until the finish. Only two other skiers – Astrid Øyre Slind from Norway and Masako Ishida from Japan – managed to follow the Polish skiing star for a while, but also had to let her go at a certain point. Kowalczyk claimed the victory today – her 3rd Birkebeiner victory in a row – 2:45 ahead of her first chaser, Britta Johansson Norgren (SWE), who overtook the chasing-duo Slind and Ishida. The third podium place stays in Norway: Astrid Øyre Slind brought 9 seconds between her and 4th placed Ishida. Before the race, Kowalczyk was not sure, if she can defeat the Scandinavian marathon skiing elite: “I didn’t expect this to happen! I felt tired after 12 kilometres of skiing, but my skies were so fast. So, I decided to push harder and it worked. I told my coach in the morning that I didn’t feel that strong, but he said that I’m strong and I should just go. 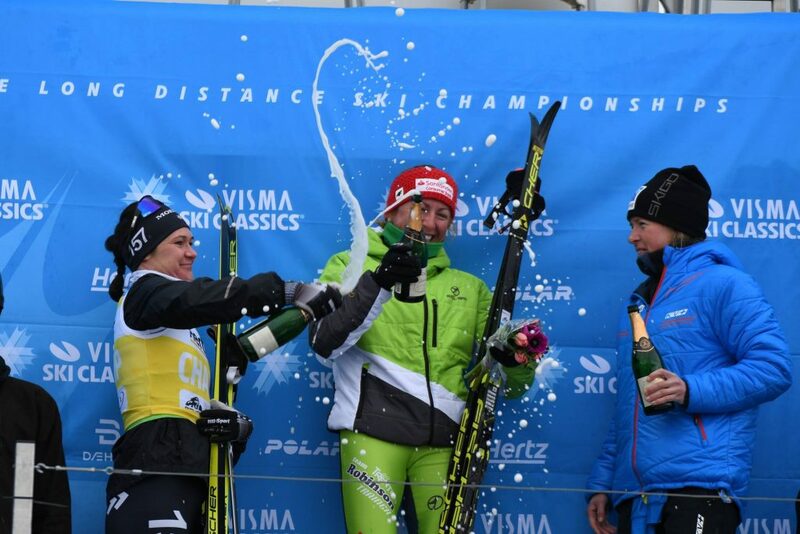 It means so much to have this hat trick, three consecutive wins, here at Birken, which is so important to all Norwegians!”, she said in a Visma Ski Classics-interview. 2nd Britta Johansson Norgren, 1st Justyna Kowalczyk, 3rd Astrid Øyre Slind. Now only one more race is left where you could collect a stamp for your Worldloppet Passport in 2019’s winter: The Fossavatnsgangan in Iceland (4th May). And a second last highlight for this winter is waiting for us: The final stage of the FIS Worldloppet Cup in Russia, the Ugraloppet on the 7th of April.